Runners need strong hips. They’re the driving force behind every stride you take and the better they are able to perform the faster you’ll cover ground. Tight hip flexors and weak glutes are common and contribute to a myriad of injuries from IT Band syndrome to runner’s knee. Strengthening your hips and glutes helps prevent injuries while improving running form and increasing speed. Here are four of Team ECRP‘s favorite hip power building exercises. Fire Hydrant. This simple body weight exercise is a winner for working the hip abductors. Start with your hands and knees on the ground in an all fours position then lift your leg away from your midline. Be sure to keep your hips still while focusing on the activation of hip and glute muscles. Pause at the top then repeat for your desired number of reps and sets. Clam Shells. Another uncomplicated exercise, clam shells also work the hip abductors. You can step the difficulty up by adding a resistance band above your knees but that’s not necessary to get the benefits. Begin lying on your side with a neutral spine. Bend your knees to 90 degrees and hips to 45 with your top leg stacked directly on your bottom one. Keeping your feet together raise your top knee away from the bottom one (abducting your hip). Pause at the top then repeat for your target number of reps and sets. Seated Band Hip Abduction. Use this move to earn strong hips an d glutes. Begin sitting on a bench or chair with a flat back and feet flat on the floor shoulder width apart. Place a resistance band around your legs above the knees. Grip the front of the bench with both hands and maintain good posture while you pull your knees apart. Do not let your knees cave in after you pause and return to the starting position for your goal reps and sets. 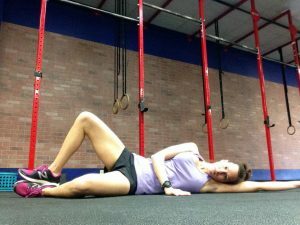 Strong hips are important and using these three exercises will help you earn them. 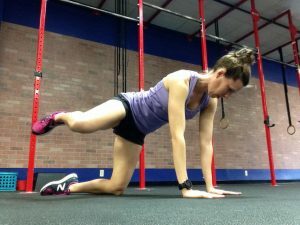 This entry was posted in Injury, Running, Strength Training and tagged glute strength, hip strength, injury prevention, running, running strength, strength training on April 23, 2018 by Coach Meredith.